The Akali Dal said the Union minister also assured a party delegation led by former Chief Minister Parkash Singh Badal and SAD president Sukhbir Singh Badal that the 60:40 ratio would be maintained as far as posting of employees from Punjab and Haryana respectively is concerned in Chandigarh. The Shiromani Akali Dal (SAD) on Thursday said the Union Home Minister Rajnath Singh has assured the notification making it mandatory for Sikh women to wear helmets in the Union Territory (UT) of Chandigarh would be withdrawn. 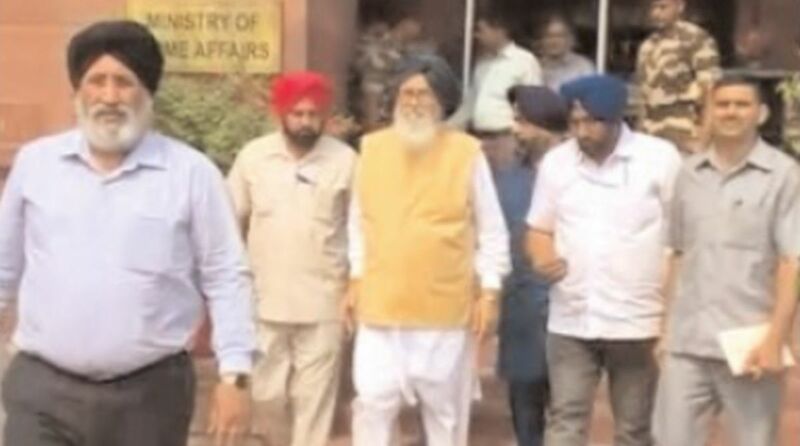 Thanking the home minister for acceding to both these demands of the Sikh community as well as Punjabis at large, Badal said Rajnath had assured the notification issued on in July 2018 making it mandatory for Sikh women to wear helmets in the UT would be withdrawn and that they would be exempted from wearing helmets while driving two wheelers as earlier. The SAD delegation had during a meeting in Delhi apprised the home minister that the notification was against the spirit of Supreme Court judgment on the issue and was also against the Sikh ‘Rehat Maryada’. The former CM also thanked the Home minister for the positive response given to the plea of the SAD that Punjab was being divested of its rights in Chandigarh by bringing in notifications which aimed at constituting a composite police cadre for union territories. He said this notification, which made provision for filling 50 per cent of police posts at entry level through direct recruitment and filling the remaining posts from the DANIPS (Delhi, Andaman and Nicobar Island, Lakshadweep, Daman and Diu and Dadra Nagar Haveli police) cadre. The former CM said this was in gross violation of the letter and spirit of the Punjab Reorganisation Act which stipulated that employees of Chandigarh administration would be taken on deputat ion from Punjab and Haryana in the ratio of 60 and forty per cent respectively. Badal said the Union home minister while reacting positively to the SAD demand asked the Union Home secretary to review the earlier decision and ensure Punjab did not suffer any injustice. The SAD said Badal also made a fervent appeal for the transfer of Chandigarh to Punjab. He said the Congress government discriminated against the state during reorganisation of Punjab with the new state being denied its capital city. He said nowhere in history had a parent state been denied its capital in such a manner. Stating that Punjab’s right over Chandigarh was unalienable, the former CM said this should be recognised and relevant steps should be taken for expeditious transfer of Chandigarh to its parent state – Punjab.